Why choose personalised golf products? Get your golfing day off to a good tee with our custom printed Golf products. Our selection covers everything from when you’re on the green waiting to take your shots with branded Golf Tees and printed Golf Umbrellas to the perfect gift for your enthusiastic golfers with customised Golf Packs. Our range contains promotional golf products of all shapes and sizes so whether it’s branded merchandise for your golfing centre or a customised present for your customers, there is plenty of choice for you. Cost effective yet practical, our promotional Golf Tees are an excellent item for stocking up your golf resort. Due to being so practical when playing the game, they’re ideal for handing out to customers when they are playing at your course. After a reusable present for your customers? Our branded Golf Bags make an outstanding choice as they have a naturally large branding area and can be reused every time you’re out on the green. Browse through our range and if you have any questions, just give our sales team a call and they will be more than happy to help find your perfect product. 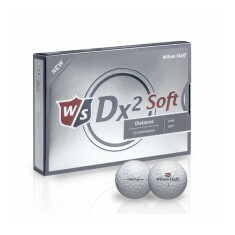 The Dx2 Soft is explosive off the driver for maximum distance, yet has an extr..